Rambling Through Parenthood : Children's Birthdays - Stop Making A Big Deal! 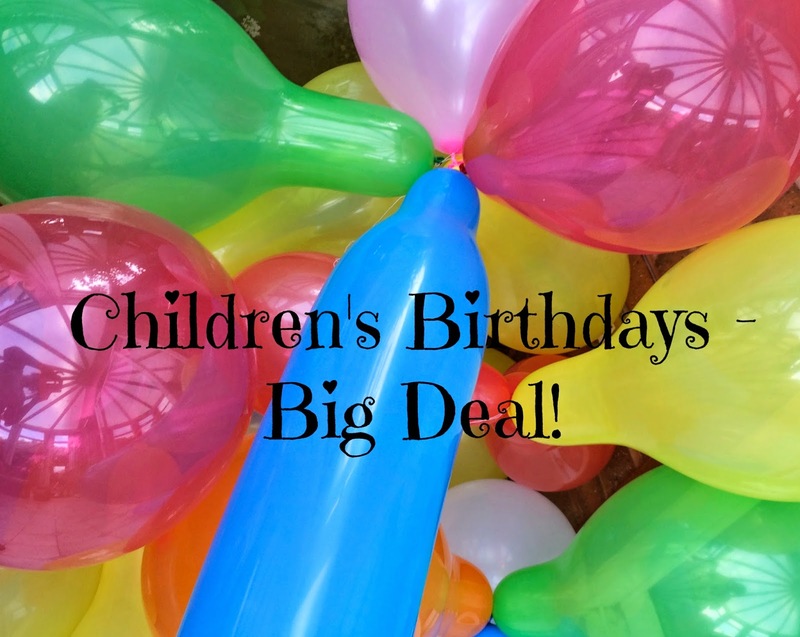 Children's Birthdays - Stop Making A Big Deal! What is it with children and birthdays these days? There seems to be more politics surrounding children's birthday parties at the moment than the whole of Westminster and Capitol Hill put together. Whatever happened to simple, fun birthdays where Mum baked a cake that looked like a volcano had erupted over it. Friends marched in with giant plastic clutter tucked under their arms, left clutching smaller junk, and still had huge grins stuck on their faces. The amount of newsprint devoted these days to the fracas over some kid's seventh birthday bash seems enough to rewrite the complete works of Shakespeare. First it was the furore over that Mum invoicing the parents of her son's classmate over a birthday party no-show. Just when we thought this kiddie party brouhaha was a flash in the pan, along comes the news that a pair of posh Mums were requesting donations to buy birthday presents for their kids and how Myleene Klass, quite rightly, took a stand against it. I mean, come on! If you can afford to send your offspring to a £1500 a month private school, surely you can afford to buy them a birthday present. Even if it is just a kindle! Next thing you know, parents up and down the country are setting up charities, the 'My Child's Birthday Fund', and are campaigning door to door to raise cash for a birthday present. Can't blame them, really. What with tuition fees and hats and the demands kids make these days, there must be precious little left over for a birthday present. But what about those parents who cannot shell out the specified tenner. Fret not, say the entrepreneurial parents. You can set up a direct debit for just £2 a month. That way, we can start to make plans for next year's present. Spare a thought, my darlings, to the poor children at the centre of this controversy. "It's my birthday today. I am so excited! Lots of presents from all my friends! Dolls, Hama beads, loom bands. Maybe a board game or two!" Err, no, precious. You are getting only one birthday present. You heard me, one present. A table. The chair will have to wait until next year. And what about a present from Mum and Dad, did you say? Emm, well, they were so busy organising the party and your one big, grand collective present, they quite forgot to buy you one. Don't worry darling, they'll just order it now. With special next day delivery and all. You will have that chair to go with the table after all. Hurray! As for next year, let's just ask for contributions towards a trip into space, shall we? hahaha, well said. I'm taking the little man to a party at the weekend, I don't feel like going, it's at one of those noisy horrible play centres. But I know the mum has probably forked out a small fortune and it would be just bad manners not to turn up, so we will, with plastic tat under arm. Haha, I can see both points of view on both issues...I'm hoping the invoice was sent out more as a protest because it is really rude not to turn up to a party especially if numbers need to be limited and the cost is per head and these sort of parties aren't a new thing they've gone on for years. But I agree children can have just as much fun for a fraction of the cost...one of our best parties was a football party we held in our garden (it was quite big) and we gave everyone a cheap ball to take home...they loved it. A girl in my daughter's (Year 4) class hired a limo to travel 2 hrs into central London to watch a show with friends. I am still scraping my bottom jaw off the floor.... What are these kids going to grow up expecting?? Totally agree with you! I agree, the whole world of parties is a crazy one. I think to expect certain presents is a terrible attitude and really not helping your child with the best start in the world. It's all crazy if I'm honest! What happened to good old fashion birthday party's. I would never expect a present and I've always taught my children it was rude to do so, so this just seems very wrong to me. My son's birthday party WAS his present a couple of years ago! We wouldn't get away with that these days, though. There's so much excitement in the classroom about other children's parties - at least at Austin's school - that he's very keen to have 'the best party EVER'. No pressure, then! Good post! There does seem to be pressure to provide your child with the most impressive birthday party ever. Even a fairly simple party can be expensive these days. Whatever happened to parties at home? It is all quite bonkers if you ask me! And having escaped all this for a few years as my middle boy doesn't like parties, I will be forced to join in again by my youngest who is already talking about his 4th birthday party - and it isn't til August! It will be a simple affair tho - pass the parcel and no criteria for gifts! Hayden's birthday is coming up he'll be 3 and I really don't want to do anything big for him a simple little tea party in the front room with his friends (he doesn't have many) and I know he'll be over the moon. It all gets very competitive doesn't it. We have Hayden's birthday coming up - he'll be 3. I know a small little gathering in the front room with his friends will be more then enough for him and he'll be over the moon. It all gets competitive I think but I think we know when not to rise to it. I completely agree - it is getting ridiculous these days and seems to be a competition between parents rather than what it should be, a party for your child! I loved my parties at home and intend to keep on giving my children the same until they are too old and ask for something different! I agree, things have got out of hand. I always try to give my children parties at home, where we collectively make special decorations, etc. for the parties. I have had many people look at me like I'm strange due to us never having had one at the soft play area or in a hall somewhere, with the magician, DJ and face painters. "You did your OWN food for your son's party?!" I was once asked. Maybe I am crazy? I'm shocked at what lengths people go to these days for a birthday bash for their little ones and that not only do you need to cater to the kids but the parents stay too. Ha well said, ive never seen so much news coverage of a kids party!